SHANGHAI - Shares of Agricultural Bank of China (ABC), the last of the "Big Four" State-owned lenders to go public, rose marginally on its debut in Shanghai on Thursday and still remains on track to be the largest initial public offering in the world. Top bank officials also indicated that the lender is likely to post a 30 percent year-on-year growth in full year profits for 2010. Agricultural Bank shares gained 0.75 percent to close at 2.7 yuan, up from the initial offer price of 2.68 yuan. The shares soared by nearly 2 percent in intra-day trading to 2.74 yuan, before settling down at 2.7 yuan. Bank officials, however remained optimistic ahead of the listing in Hong Kong on Friday. Zhang Yun, president of Agricultural Bank said he was "relatively satisfied" with the stock price as the current market conditions are full of uncertainties and challenges. The bank's debut performance shows that investors are still positive about ABC's future growth potential, Zhang told reporters after the listing ceremony. The nation's third-largest lender in terms of assets is battling turbulent times, after the Shanghai Composite Index declined 17 percent this year, to raise $19.2 billion from a dual listing of shares in Shanghai and Hong Kong. Analysts said the Shanghai performance will help the H share listing in Hong Kong, where the stock is priced at HK$3.2 per share. "The flat stock movement on the first trading day is in line with my expectations. Given the current weak market sentiment, it is difficult to expect huge jumps," said Wu Wei, a banking analyst with Industrial Securities. Wu said ABC's A share movement is closely related to the overall performance of the mainland stock market, which is facing liquidity strains. Despite the market headwind, the bank is still on course to break the all-time IPO record. If the greenshoe options, or the right to issue additional shares, are fully exercised in Shanghai and Hong Kong, the float could raise as much as $22.1 billion, and surpass the $21.9 billion record set by Industrial and Commercial Bank of China IPO in 2006. Agricultural Bank had earlier said it had oversold the Shanghai tranche by 15 percent and will exercise the overallotment option. However, it has not indicated whether it will do the same in Hong Kong where the issue was nearly six times oversubscribed. Following the IPO, Agricultural Bank will become the seventh most valuable bank in the world with a market capitalization of nearly $127 billion. That will also mean that China is now home to four of the top 10 global lenders in terms of market capitalization. 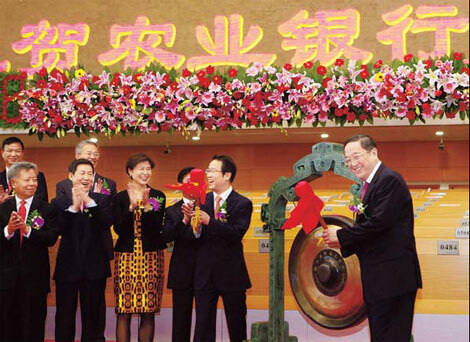 Zhang said Agricultural Bank's unique franchise - a lock on the 800 million rural dwellers, as well as a strong position in the nation's developed areas - would help the lender prosper from China's accelerated urbanization drive and the government's plans to spur consumption in rural areas. However, Zhang admitted that the bank is under pressure to reduce operational costs for better profitability. "The bank's daily costs are around 300 million yuan, I have to think of ways to secure daily revenue of over 800 million yuan, so that we are in a position to offer better returns to shareholders and investors," he said.